A decade ago, I was able to show my work at CBGBs 313 Gallery before they closed. With that in mind, I created my androgynous crucifix Reach Out and Touch Faith to hang high up on the dark brick wall, spotlighted above all else. The sculpture could have remained as it was, I liked the idea of the free-floating figure, but I often thought of placing it upon a cross, mostly for support. I felt, however, that if she was on a cross, there had to be more. 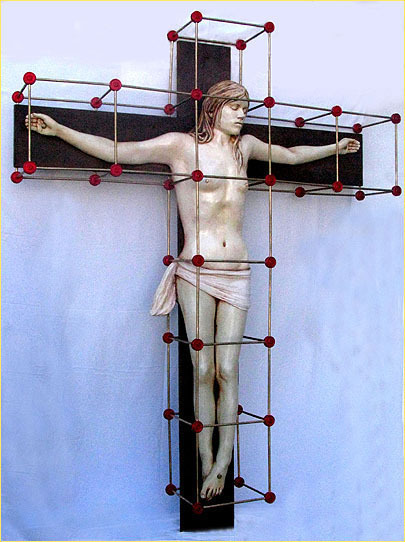 Inspired by scientific models of atoms creating molecules, I decided to create a molecular cross engulfing the androgynous crucifix. I especially loved the idea of using simple Tinkertoy discs as the atoms. Using these simple playthings for the complex system of creating molecules seems to imply that for God, creating atoms, molecules, and indeed the whole universe, was merely childs play for Him. Also, a warm thank you KNEX for supplying me with the Tinkertoy discs I needed.